If arriving in Japan at Narita Airport, you can immediately exchange your Japan Rail Pass voucher at any of the JR Ticket Offices found at the airport terminals. You can activate it the same day to reserve a seat on the Narita Express, taking you to central Tokyo in less than an hour. Rikugien – A beautiful, traditional Japanese landscape garden in Tokyo, Rikugien is home to a wide variety of trees that transform into an amazing sight once the autumn months kick in.From JR Yamanote Line’s Komagome Station, the garden’s main entrance is about a five to ten minute walk away. Koishikawa Korakuen – Constructed during the Edo Period, Koishikawa Korakuen is one of the oldest and most gorgeous Japanese gardens. 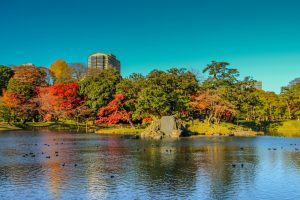 It has an extensive range of different species of plants and trees that turn the garden into a blanket of red and golden yellow leaves in autumn.Take the JR Chuo Line going to Iidabashi Station, and then walk ten minutes to the park’s entrance. Imperial Palace – Home of the Japanese Imperial Family, the Imperial Palace grounds cover a vast space populated by many different types of trees that are a sight to behold once their foliage changes colour during autumn.It is located about a 10-minute walk from Tokyo Station. Nikko – While Nikko is known by many for the Toshogu Shrine, it is also home to many autumn viewing spots, including the Yumoto Onsen, Senjogahara Marsh, Ryuzu Waterfall, and Lake Chuzenji.From Tokyo Station, take a Shinkansen to Utsunomiya Station and transfer to a JR Nikko Line train going to Nikko Station. The entire trip takes about one hour and forty minutes and is covered by your JR Pass. 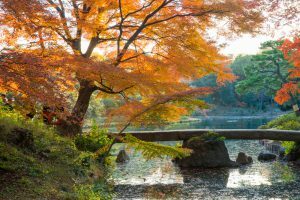 Kamakura – Also a popular day trip destination from Tokyo, Kamakura boasts of numerous autumn foliage viewing spots, especially around its historical temples and shrines. Some of the most popular are the Hasedera Temple, Kamakura-gu Shrine, Meigetsu-in Temple, and Engakuji Temple.From central Tokyo, take the JR Yokosuka Line (from Tokyo Station) or the JR Shonan Shinjuku Line (from Shinjuku Station) to Kamakura Station. The one-way journey takes about an hour. Karuizawa is a mountain resort which sits at the base of Mount Asama, an active volcano in Nagano Prefecture. At an altitude of about a thousand metres, it is an excellent destination for those who want to spend a cool and pleasant day or two during the hot and humid summer months. During autumn, it attracts flocks of tourists wanting to get the best views of the spectacular autumn foliage. From Tokyo Station, the Shinkansen ride to Karuizawa Station takes about an hour and twenty minutes. 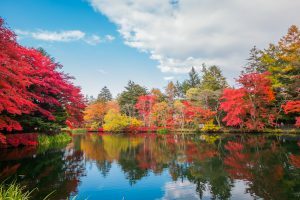 Kumoba Ike – An artificial pond surrounded by dense forests and several walking trails, Kumoba Ike is perfect for people who like to immerse themselves in nature.From Karuizawa Station, hop on the Town Loop Bus (Inner Route) and get off at the Roppontsuji stop. Kyu Usui Toge Miharashidai – The Kyu Usui Toge Miharashidai, or Usui Pass Observation Platform, offers scenic views of the Gunma mountain range and Mount Asama, as well as the valley of red and yellow foliage below.Board the Karuizawa Aka Bus, which is a red tourist bus that links the Manpei Hotel and the Karuizawa Ginza to the observation platform. A one-way ticket costs 500 yen, while a return ticket is 800 yen. 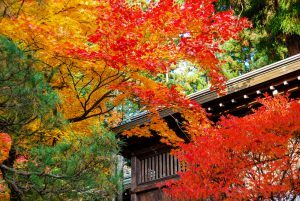 Karuizawa Autumn Festival – Observed between 2 October and 3 November, the Karuizawa Autumn Festival is one of the most important events in the region. During this time, you can enjoy different events and enjoy discounted rates at some museums and inns.Information about the festivities is available at the Tourist Information Office at the Karuizawa Station. Next stop is Takayama, which is a city located in the mountainous region of Hida in Gifu Prefecture. From Karuizawa Station, board a Shinkansen going to Toyama Station, and then transfer to the Ltd Exp (Wide View) Hida Line to Takayama Station. The entire trip takes a little less than four hours, and is covered by the JR Pass. Old Town – With many well-preserved Edo Period buildings and structures, Takayama’s Old Town is the best place to be for a glimpse of what life was like many centuries ago.It is only a ten-minute walk from Takayama Station. Shiroyama Park – Covering an area of about 60 acres, Shiroyama Park is a public park around the Takayama Castle ruins and is home to various trees, including more than a thousand Yoshino cherry trees.From Takayama Station, it takes twenty minutes to walk to the park. Higashiyama Temple area – The Higashiyama Temple area can be explored via the Higashiyama Walking Course, a 3.5 kilometre trail that passes by about a dozen shrines and temples, the old Takayama Castle ruins, traditional houses, and through a wooded area inhabited by interesting wildlife and various trees and plants. At a leisurely pace, you should be able to complete the round trip in about two hours.From Takayama Station, walk about 15 minutes to the Museum of History and Art, which is where the trail both begins and ends. Kitayama Park – Home to different types of trees that create beautiful red and yellow canopies in autumn, Kitayama Park is a popular viewing spot for great views of the stunning autumn foliage.It is located near the Festival Floats Exhibition Hall and the Miyagawa Market in the city’s Old Town area. Takayama Festival (Autumn) – Held from 9-10 October, the Autumn Festival in Takayama is celebrated every year in honour of the Hachiman Shrine. Its highlights include a procession around town, a karakuri performance, and a festival float display and exhibition.Hachiman Shrine is located a few minutes’ walk from the Old Town district. To return to Tokyo, from Takayama Station take the Ltd Exp (Wide View) Hida Line to Nagoya Station and then transfer to a Shinkansen headed to Tokyo. The whole journey takes about four and a half hours and is fully covered by your JR Pass. Note: The timing of the appearance of the autumn foliage varies per region every year, so be sure to check the internet for autumn foliage forecasts and reports before your trip so you can plan accordingly.